Sunny morning, so Drumboe appealed. Sun early, then dull with rain. This is the first appearance of the Angelica. I take note of where all these specimens are, so that I can return in July when they open - they are a major source of insect pictures. Lesser Celandine has been in flower for 5 months, now. It is on every verge, lane and streamside in great numbers. On the left, the flower buds of the Wild Cherry will open in a couple of days. The leaf buds of the Horse Chestnut on the right have just opened. 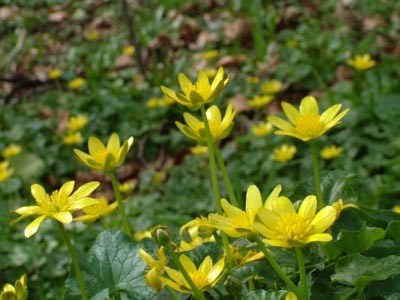 Some of the specimens of Lesser Celandine have purplish centres to the leaves. 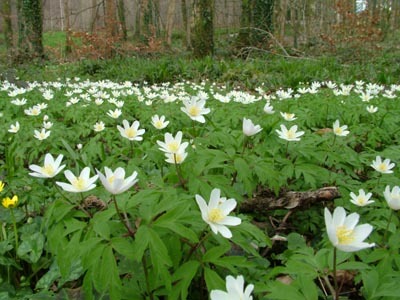 I like carpets of flowers like these Wood Anemones, but they rarely translate effectively to the flat screen. My second Hoverfly of the year - Melanostoma scalare. This species is on the wing all year except the three winter months of December, January and February. The air was abuzz with these Blow-flies. The specimen on the left is the common blue-bottle, but the right hand specimen is very different.